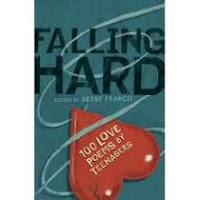 Today I am sharing Falling Hard - 100 Love Poems by Teens edited by Betsy Franco with you. When I picked up this book of adolescent poetry I was ready to find plenty of intense emotion and declarations of undying love. Instead I found an intriguing mix of vulnerability, honesty, obsession, humour, emotional awakenings and quirky tales. The poems Franco has chosen deal with the complexity of teenage life without weighing the reader down with intensity. The stories strike a palatable balance by dealing with topics such as new love, being stood up, fitting in, crime, acknowledgement of loved ones and lost love in a variety of styles and emotional approaches. One of my favourite poems from the book is Pledge of Affection to a Nerd (page 23). Written by 16 year old Laura Tabor, the humour is so mature that I found myself laughing aloud at the affection and subtlety of the verse, just beautiful. you beat the final level of Escape from Modor! whispering sweet algorithms in my ear. Personally I felt privileged to get this glimpse into the lives and hearts of these talented individuals. The sensitivity, awareness and humour of so many of these young poets is apparent and blasts many stereotypes surrounding teenagers out of the water. A rewarding read that I highly recommend.